In 2-quart saucepan, beat egg yolks and sugar with wire whisk until well mixed. Beat in milk. Heat to boiling over medium heat, stirring constantly; reduce heat to low. Boil and stir 1 minute; remove from heat. Pour into medium bowl; place plastic wrap directly onto surface of custard mixture. Refrigerate about 1 hour or until chilled. Add cheese to custard mixture. Beat with electric mixer on medium speed until smooth; set aside. In chilled medium bowl, beat whipping cream and vanilla with electric mixer on high speed until stiff; set aside. In small bowl, mix espresso and rum. Separate ladyfingers horizontally; brush with espresso mixture (do not soak). In ungreased 11x7-inch glass baking dish, arrange half of the ladyfingers in single layer. Spread half of the cheese mixture over ladyfingers; spread with half of the whipped cream. 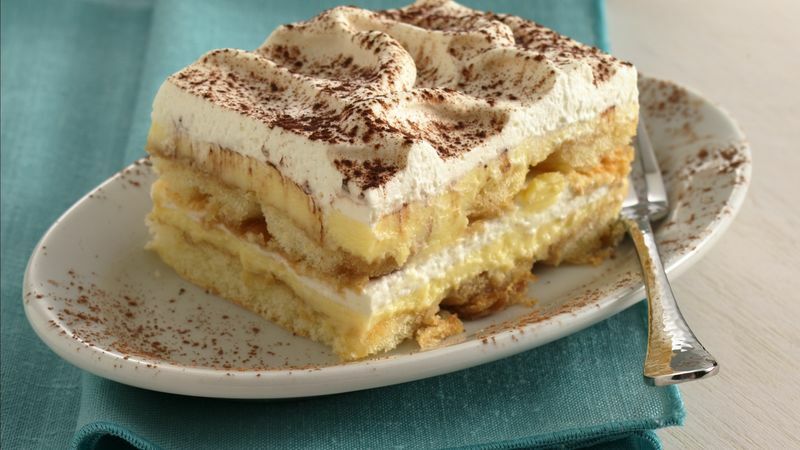 Repeat layers with remaining ladyfingers, cheese mixture and whipped cream. Sprinkle with cocoa. Refrigerate at least 4 to 6 hours to develop flavors but no longer than 24 hours. Store covered in refrigerator. Mascarpone is a sinfully rich double or triple cream cheese that originated in the Lombardy region of Italy. It has a delicate, buttery flavor with just a hint of sweetness. Look for it in the cheese case in large supermarkets, specialty cheese shops or gourmet food stores. *1/8 teaspoon rum extract mixed with 2 tablespoons water can be substituted for the rum. **2 packages frozen (thawed) pound cake (10.75-oz each) can be substituted for the ladyfingers. Place each pound cake on its side; carefully cut each into 3 lengthwise slices (to total 6 slices). Brush each slice with espresso mixture (do not soak). Arrange 3 slices crosswise in baking dish. Layer as directed in step 4, adding remaining 3 slices.